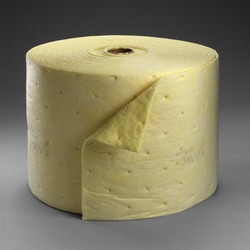 Chemical sorbent roll can be easily cut to cover small areas or fit tight corners. Rolls of sorbent material are used for large spill management or in areas where spills may occur. May be used to cover bench tops in prep for a spill or as a work surface. 3M designs and manufactures a comprehensive line of products that can address your diverse applications. Widely recognized for innovation, reliability, and global corporate strength, 3M has the products and services you need, and the name you trust.